The plan of the Ministry of Forestry to send 1,560 personnel to Sumatra and Kalimantan (Jakarta Post, Tuesday Oct 17th, 2006), I think will not be successful. People from outside of these areas cannot understand the dangerous and severe situation on the ground, especially the difficult and extreme conditions inside peat swamp forest and on deforested, degraded peatland. According to a Forestry Ministry Spokesman (Mashyud), they have the Manggala Agni, as ground troops for fighting fire, equipped with four-wheel drive vehicles and special portable tools that can inject water beneath the peat surface. Different than Mahsyud said and based on my evaluation on the Manggala Agni activities in Central Kalimantan, they have not been working effectively, although they have much high quality equipment and are supported by many cars and motor bikes. They have allowed fires to take hold beside the roads because there is no water in the ditches for them to take action. Sometimes they have used the limited water in some ditches to suppress fire, but they have had to stop when the water was finished, although fire was still running out of control well into the interior of the landscape. So ineffective has Manggala Agni been that a large area in front of their office in Kalampangan village has been on fire for a week and one house was burned down on October 13th at 10.30 am. Their actual success is very inadequate compared to the equipment and support facilities they have and bearing in mind their responsibility to maintain peoples’ health and safety and protect the environment. As coordinator of the UNPAR/CIMTROP Fire Fighting Team (Tim Serbu Api) TSA KALTENG since 1997 and now I had established new group called TSA KALTENG as a Community Base Fire Management (CBFiM) in grass root level, I know that the Government-funded fire brigade, including Manggala Agni, has only worked along the roads, which are few, and have never sunk deep wells to reach the only reliable source of water. I also know that all other fire fighting groups based in Palangka Raya, apart from TSA, operate without strategy and targets. In fact, they only follow behind the fires and are unable to put them out. Since the fires takes hold in the peat, where it can continue to smolder for weeks and reignite when windy conditions prevail, the situation becomes much worse. Therefore, the fires spread very fast into the interior where they become uncontrollable wild fires. Sending helicopters and 1,560 personnel to fire areas, albeit with modern equipment and large sums of money, cannot guarantee to stop the fires in the short term. Helicopter pilots will be unable to see where the nuclei of the fires are owing to the dense smoke and haze and operating under these conditions will be extremely hazardous. The targetting of ‘water bombs’ will be inconsistent and irregular while it will be impossible to drop sufficient water to make an impact. The water dropped by this means will not remain on the surface to extinguish fire but will soak into the tinder-dry surface peat and dissipate immediately. As a group of local people with firefighting experience since 1997, TSA has the knowledge, strategy and methods to combat forest and peat fires. Success in suppressing these fires is not just determined by modern equipment, lots of people, valourous of people and large amounts of money, but most important are dedication and determination. 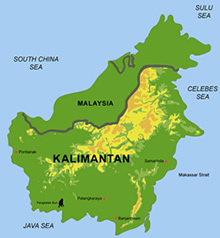 If the Minister of Forestry has the power to send more than one thousand five hundred persons to Central Kalimantan and is allocating a large amount money for travel, accommodation and salaries, it would be better to send this budget to the local team that already has the experience and proven track record. TSA has the ability, experience and adaptability but does not have money. In order to make real progress towards controlling and suppressing forest and peatland fires all groups involved should be coordinated to provide coordinated and integrated action directed by the provincial governments under the direct control of our Governors. This must also involve local people who should be consulted and paid appropriate compensation for their time spent in the dangerous conditions in the field. Only by this way can a proper strategy be implemented and the fire menace stopped for ever. 1. To authenticate this statement above please check the location of the areas controlled by TSA KALTENG. 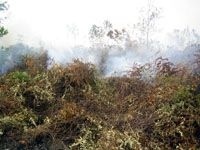 Until now TSA has extinguished fire and prevented its spread in a 8 km x 10 km area in Block C of the ex Mega Rice Project near Kalampangan (south of Palangka Raya) and about 30 km along the Sabangau river where the Natural Laboratory for Peat Swamp Forest (NLPSF) Kereng Bangkirai-Sabangau is located. Before TSA operated here fire always occurred everywhere. 2. CIMTROP is the Centre for International Co-operation in Management of Tropical Peatland that is based at the University of Palangka Raya, Central Kalimantan, Indonesia. Its director is Ir. Suwido H. Limin MS who is also the co-ordinator of TSA KALTENG. 3. TSA KALTENG is an initiative of the EU funded RESTORPEAT Project to ‘Restore tropical peatland and promote its wise use to ensure sustainability of renewable natural resources’. TSA KALTENG provides sustainable livelihoods for community based stakeholders involved in firefighting in peatland areas of Central Kalimantan. 4. RESTORPEAT is a multidisciplinary research and development project funded by the European Commission. It operates from 2004-2007 and involves 14 partner institutes in Europe and Southeast Asia. The University of Palangka Raya, through CIMTROP, is a RESTORPEAT partner. 5. TSA KALTENG is an effort Suwido H. Limin to realize of the result of the Workshop on Fire 14-15 April 2003 in Palangka Raya. The Governor of Central Kalimantan had invite all of Head Regency to formulate strategy and Action Plan for Prevention and Suppressing the fire.